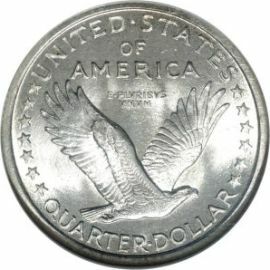 The first type of Standing Liberty Quarter was dated 1916 and 1917. The coinage Act of 1890 had stipulated that all US coin designs must be in production for at least 25 years. 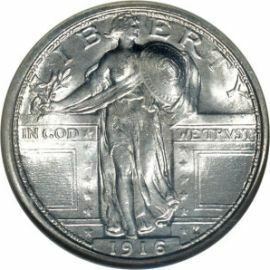 When the earlier Barber Quarters, produced from 1892 to 1916, had completed their 25 year span, a new design was born. while the same hand carries an olive branch. The inscription "LIBERTY" is at the top of the front, while the date is below. The motto "IN GOD WE TRUST" shows on both sides of Liberty. The main reason this is a two year type coin is that the public disagreed with Liberty's exposed breast. Type 2 coins of this series show Liberty covered with chain mail and subsequently lasted much longer.